With the EC10, customers are taking full advantage of Modern LAN principles, protecting existing infrastructure assets, and eliminating any need to rip/replace the established Coax cabling. The EC10 unmanaged switch optimizes network design with advanced interoperability and easy integration into the overall LAN creating a secure, robust path for IP endpoints. EC10 delivers 100Mbps symmetrical (full duplex) and PoE+ (30W) over Coax with 2,000ft (610m) reach, providing substantial power to support bandwidth demanding IP cameras easily and reliably. EC10 comes preconfigured and ready to deploy, making modernization to IP quick and efficient in organizations of every size. Multi-site modernizations are greatly simplified with a repeatable, predictable, scalable deployment methodology used across every location. There are three media converter options available to pair with the EC10 switch and extend PoE over Coax. 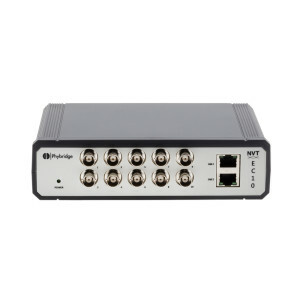 The EC-Link and EC Link+ are single endpoint solutions and the EC4 enables 4 IP endpoints from a single long Coax cable. NV-PS55-165W 55VDC 3A (165 Watts), power supply for EC10 or PL-08 switches.